Meditation is the beginning point to expanding your perception into the spirit world. The ultimate goal for many is to tap into that inner wisdom, receiving a stronger guiding force in life. This is achieved by allowing the third eye, or the pineal gland, to open. Located in the center of the mind, it has been believed for centuries that this is the gateway to receiving spiritual awareness. 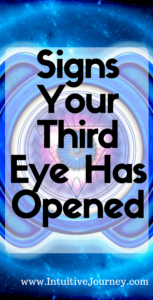 A warm sensation or a feeling of being touched in this area is a sign that the third eye has started to manifest. Increased intuition is another sign that your third eye has opened. As the third eye awakens, different foresights can be realized. This feature is different in every individual and has to be accepted as our intuition trying to get our attention. This feeling could be one of fear, a premonition of the future or knowing that a certain act is about to take place. It is not always 100% accurate, but take it and develop it as a gift. Remember how vivid the natural colors appear in the fall? Being able to identify with an increased brilliance of colors and light sensitivity are indications that your ability to capture the depth of the universe is expanding. Another sign is not being able to get enough sun. It is almost like your skin cannot live without the warmth of this energy. If you feel your tolerance level increasing, this is no accident. As the third eye opens, a feeling for life and the world around us becomes more intense. You may find yourself seeing a type of bird for the first time as a joy and your attitude of people becomes more accepting. As the third eye develops into a part of your being, there is often a slight headache that is felt in the center of the forehead. This is a good sign that you are in third eye overload! Go outside, soak up the sun and meditate or walk. The pressure will soon pass. Never be fearful of what is occurring as the opening of the third eye becomes a part of your life. Cherish this new revelation as a higher form of spirituality that will work for you in life.